In order to allow our client to build their application software (ex. Access Control, Time Attendance, Payroll, HR, etc.) 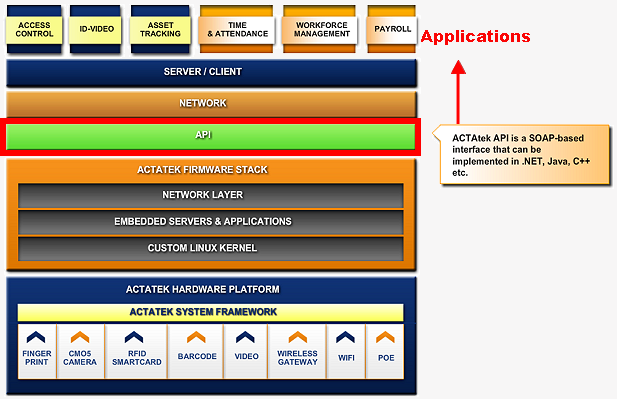 around the ACTAtek ID Management Platform, we offer a free set of SOAP/API tools (examples included) to ease the development process. Software engineers require a basic knowledge of programming in XML and TCP/IP network. The required downloads of manual and samples coded can download via our technical support team or contact out regional office for more information. 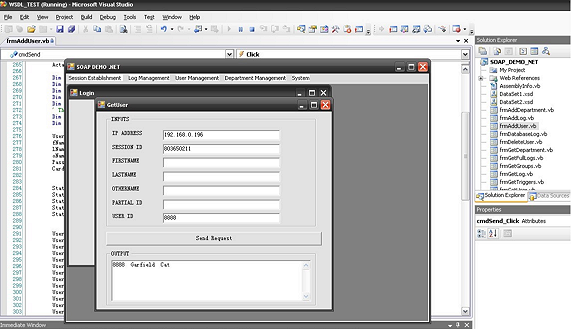 The ACTAtek SOAP/API will contain information on writing applications using the ACTAtek SOAP interface. This also contains datatype definitions, WSDL information and sample code in Microsoft Visual Basic 6.0, C, Microsoft Visual Basic .Net 2003/2005/2008 and Sun Microsystem's JAVA. SOAP: provides a XML based infrastructure for exchanging structured and typed information between peers in a decentralized, distributed environment.